GUP Magazine is your Guide to Unique Photography. Published quarterly and distributed worldwide. 180 pages GUP devotes each issue to a specific theme, featuring every angle of photography. From extensive portfolios of respected photographers and young talent to a complete international gallery and museum exhibitionlist. It makes GUP a smart and inspirational guide for photographers, professionals in the business and all those interested in the art of photography. 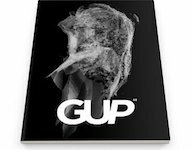 As an extension to the printed publication GUP is also present online through its HTML5 platform on which even more books, bookmarks, news, articles and extended portfolios are available.